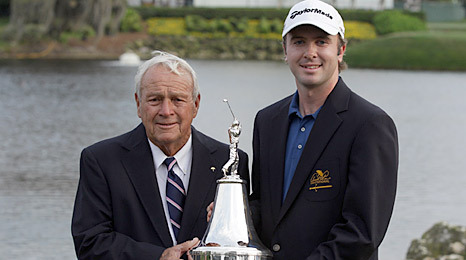 Martin Laird defied the challenge of American Steve Marino over the final round of the Arnold Palmer Invitational at Bay Hill to win by a single shot. The Scot squandered his two-shot overnight lead, but recovered to overtake Marino with two holes to play. A solid approach over water at the last and a two-putt from about 80ft ensured a second PGA Tour title for Laird. England's Justin Rose took a share of third at six under with a round of 68 that included a five-under back nine. Laird began the day with a decent advantage over another American Spencer Levin but bogeyed the third, seventh and ninth to reach the turn in three-over 39. The 28-year-old slipped further off the pace as he hooked into the water following a poor tee shot for a double-bogey six on the 11th. His resurgence began with a birdie at the 12th and, despite a further bogey on 14 to fall three shots behind, the US-based Glaswegian picked up another two strokes at the 15th and 16th to restore a two-shot lead as the charging Marino faltered. "I've had perseverance all week and it paid off," said Laird, who lost a play-off in Las Vegas last year and also lost to Matt Kuchar in a play-off for the Barclays event in August after three-putting the 72nd hole. He added: "I don't know if I was nervous. I thought in the morning that I've let a few tournaments go and I came out today, I wasn't joking around - this was going to be my tournament to win, and I felt comfortable. "I never thought about not winning. At three down I didn't have a choice, I had to make birdies - Steve was playing so well and he wasn't going to drop all the way back to where I was. "That was the focus - not a place finish, I was out there trying to get this trophy." Marino, searching for his first win on the PGA Tour, made birdies at six, nine and 10 but his progress was checked with bogeys at seven and 15. He was further hampered when he pushed a bunker shot through the back of the green at the par-three 17th and took three putts for a double bogey. Although he produced a birdie at the last to halve the deficit and increase the pressure, it was not enough as Laird held his nerve to clinch a second PGA Tour title following his victory in the 2009 Justin Timberlake Shriners Hospitals for Children Open in Las Vegas. A disappointed Marino said: "I just got a little aggressive with the par putt, just hit a terrible next putt. But I was able to come back and birdie 18 to give myself a chance. "But that's pretty disappointing. I played so well all day and just one hiccup on 17 cost me the tournament." Laird became the first European to win at Bay Hill in its 33-year history and completed a successful day for Scottish golf after countryman Paul Lawrie, the 1999 Open champion, won the European Tour's Andalucian Open to end his nine-year victory drought. Former world number one Tiger Woods finished on one under after a level-par 72 in Florida, but insisted he could still win a fifth Masters title in April. "Absolutely," replied the six-time Bay Hill winner when asked if he believed he had the form to succeed at Augusta. "I really hit the ball well and the things that we have been working on for the last couple of weeks, really, really felt comfortable. "I felt I was able to control just about every shot."